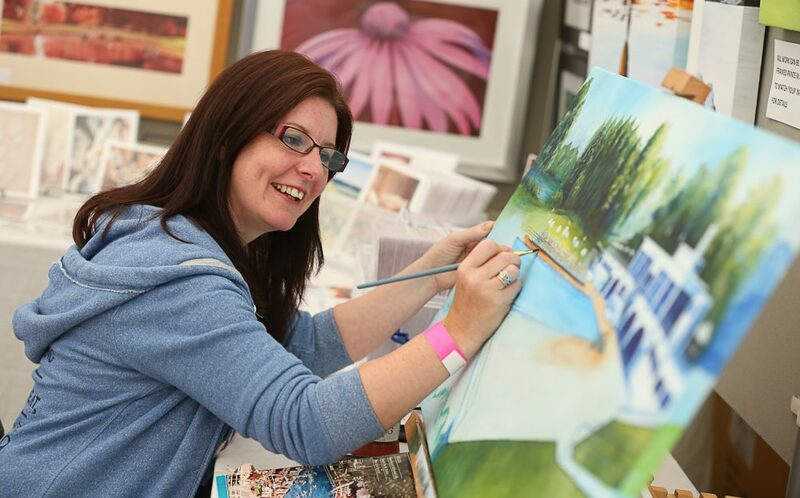 I’m a Staffordshire based artist and this all started when my mother in law couldn’t see a painting she liked for her newly decorated lounge. She couldn’t find the right colour, size or shape to suit the wall space and wanted a style that reflected her personality. I flippantly said I would paint one for her not expecting her to take me up on the offer but before I knew it we were sitting down with a nice bottle of wine discussing ideas and I’ve been creating paintings ever since. As you can see from my work I love colour and experimenting with different techniques, my hubby often says that I should concentrate on developing a ‘Jo Watson’ style, not to be so varied and I can understand his thinking, but for me each painting should dictate its ‘own’ style, a style that’s unique to the subject, telling its own individual story not just through the objects you see in it but through the colour used and the actual way it’s painted. Rightly or wrongly these have become my values and for now they seem to be working, I’m lucky enough to have the skills to be varied in my approach and people seem to like what I do. A painting is a very personal thing both in its creation and when buying it…just like music there’s so many styles to choose from…so it’s important it means something to you especially if you’re going to live with it on your wall for a while. I love it when I can capture a moment on canvas that ultimately creates an emotion in someone else, a chance for that person to relive a memory of a place or time that’s special to them. “I commissioned Jo Watson to paint a scene from one of our family holidays. This was a present for my husband’s 50th birthday. The painting was fabulous. It captured our memories well.